Editor’s Note: There are many opportunities to make photographs at a football game. Not surprisingly, your opportunity depends on the type of access you have to the field. There are different strategies for shooting from the stands versus the sidelines. 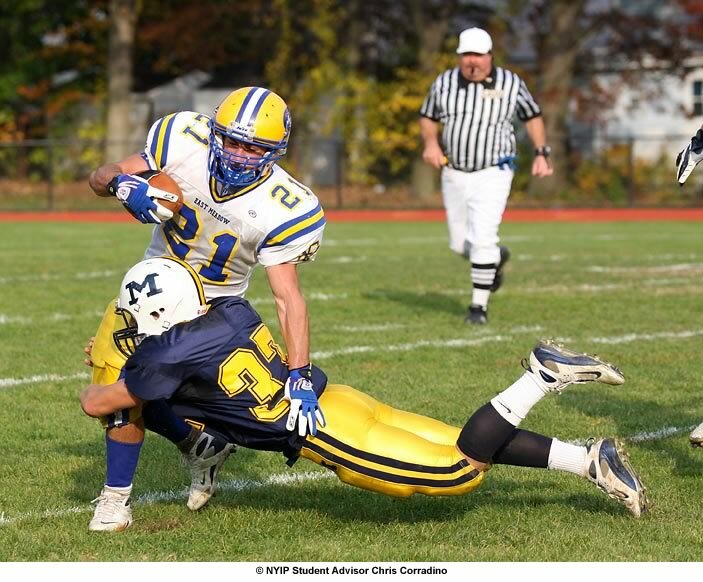 In the first portion of this article, we’ll look at the options available to fans, and then we’ll turn to the experiences of NYIP Student Advisor Chris Corradino, who has an active business photographing high school football, and shows his work at http://www.christography.com. He’s out there on the sidelines, usually for two games every weekend. In Part Two, we’ll turn to professional and college football, where access is more demanding, and the competition for the best photographs includes the newspaper and magazine professionals. Don't sneeze at this picture. At a pro game, if you’re a fan with a ticket, you're likely to be sitting here too. Don't despair. If you really want to shoot the action on the field, use a very long lens — at least, 200mm and preferably more — and steady your camera on a tripod or monopod. But use some common sense. Every time there's a big play, what is sure to happen? Of course. The fan in front of you is certain to jump up. If your camera is firmly planted in front of you, you'll end up with a wonderful picture of his back! Of course, in “lesser” games — Pop Warner games, high-school games, and small-time college games — you may be able to walk right up to the sidelines. NYIP students may find their ID card helpful in gaining access to high school games. The most important point we can make for first timers shooting from the sidelines is this: Watch out! You are standing there unprotected, and you must always be ready to duck when a 250-pound running back comes charging like a locomotive in your direction. Not only is he bigger than you and in full motion, but he's also clad in armor — he won't feel a thing, but you can get clobbered! And your camera will probably be trampled as well. So a word to the wary. Be prepared. Let’s start with some basic points you should keep in mind if you’re new to the sidelines. Show the action in close up. Get in tight and make the players big and important to your image. Even from the sidelines, you’ll be using a long lens. Show the ball. While not every picture has to show the ball, many cry out for it. The good news is that in football, the ball is usually visible. In the quarterback’s hand, being handed to a running back, or gracefully arcing toward a player downfield, descending just above his fingertips. Don’t expect to get every picture of every play. Unlike some sports where you can frequently anticipate the action, football is unpredictable. The play may come your way, or it may be on the other side of the field. It may be 50 yards downfield from you, right in front of some lucky photographer, but out of your range. You can’t cover the whole field. While you’ll miss some great opportunities, you have to keep your focus on being ready to capture the ones that do come your way. Don’t forget to get reaction shots too. What are “reaction shots”? Pictures of agony or ecstasy on the faces of the people in the stands, or the coach and players on the bench. They will be up and roaring with every big play. Go for close-ups. Look at any sports page or magazine, and you’ll see that lots of reaction shots are used. Now, let’s get to the sidelines with Chris Corradino. It is always important to arrive early so you can shoot the team running through their warm up session. This is a perfect opportunity to work out your exposure settings, and game time shooting location. You want to find a place that is central to the action, but where your view will not be blocked. With football, you will often end up working your way up and down the sidelines, so wear comfortable shoes! Thirty to sixty minutes before the game is also a great time to ask for team rosters. This will be very important for your caption information, especially if you are shooting for a newspaper. Be prepared with a pen, pad, and business cards, as parents will often ask you to zero in on their athlete. Write down the player’s name, position, jersey number, and team. Ask for their email address, and let them know you will send a few watermarked samples after the game. Give your business cards to anyone who inquires about your services. You never know, when the season is over, you just may get a call asking for you to photograph graduation or prom portraits. As a professional photographer, you can offer their families memories that last a lifetime. For now, let’s get back to the action. Here’s a photo that shows the ball about to be intercepted by the cornerback. It’s not uncommon at high school games to have fences and adjacent homes in the background. There’s not much the photographer can do other than use a large aperture to try to throw the background out of focus or at least soften it as much as possible. The answer may surprise you! Although the RAW format offers photographers greater control over their images in the digital darkroom, JPEG large/fine is the preferred format for sporting events. Camera buffers will offer much greater bursts of speed when using JPEG instead of RAW. This extra buffer speed is critical when trying to capture the height of the action. In addition, using the JPEG format will allow you to store nearly double the amount of images than the RAW format. The last thing a sports shooter wants is to be changing memory cards as the winning quarterback rides off the field on his teammate’s shoulders. As noted in the NYIP lesson on sports photography, a shutter speed of at least 1/500th is recommended to freeze the action. Sometimes using 1/1000th or faster is necessary to freeze a ball, or an airborne player. While that may be no problem on a sunny day, this speed can be difficult to attain in deep shadows or a night game in a poorly-lit stadium. Second, and perhaps most importantly, a wide aperture will provide a nice clean background (bokeh), and allow your subject to really stand out. Even with these fast apertures, you will usually need to use an ISO speed of 400, 800, or even 1600. Be careful with using ISO 3200 as it can be quite grainy. One of the nice things about digital is that you can change your ISO sensitivity on the fly without fumbling through rolls of film. For night games, we recommend using an external flash unit. It is also a good idea to use a flash bracket to help reduce redeye. While the flash won’t really be effective with distant action, it will generally cover the range of a 70-200mm. Of course if the player is further away the unit has to work harder which in turn uses more batteries, and slows recycle time. While good judgment should always be exercised, there are usually no restrictions on using a flash. An important point: Being respectful to the players, coaches, referees, and fans will make your job a lot easier. Photographers who understand the sport they are covering have a better chance of getting “the shot”. For example, if it’s 3rd down and long in the local football game, you can most likely expect a pass, and therefore benefit from focusing on the wide receivers. If you are new to football, don’t worry, just follow the ball and you will be focused on the action! The final whistle has blown, and you are about to pack up your gear. WAIT! Not so fast! Shoot the victory celebration, and capture the other team’s reaction. After all, these are emotions that make sports so interesting. Don’t forget to make an image of the final score on the scoreboard for your captions. Lastly, take a few shots of the fans as they celebrate, or hang their heads in the bleachers. Check out the wealth of helpful sports photography tips and stories on www.sportsshooter.com. Also, look through the images in Sports Illustrated, and your local sports section for inspiration. Also, check back here at www.nyip.edu for the next installment of How To Photograph Football as well as tips and articles to help you become a better photographer. By: Chris Corradino on April 9 2011.